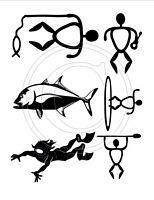 Our Island Life stamp set includes 6 separate petroglyph stamps, ranging in size from 1.25 in. to 2.5 in. Fishing, Ukulele, Ulua, Surfing, Snorkeling , Paddling.